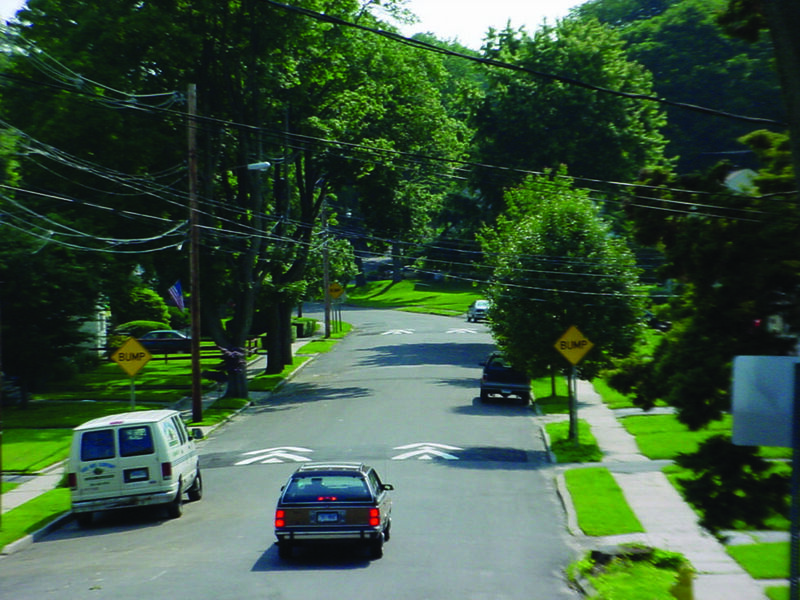 Speed humps are parabolic vertical traffic calming devices intended to slow traffic speeds on low volume, low speed roads. Speed humps are 3–4 inches high and 12–14 feet wide, with a ramp length of 3–6 feet, depending on target speed. 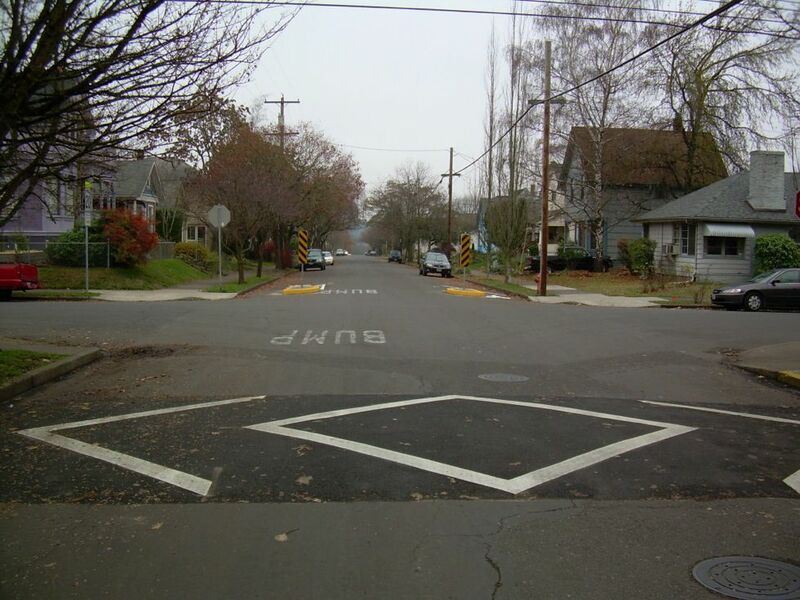 Speed humps reduce speeds to 15–20 mph and are often referred to as “bumps” on signage and by the general public. Many residential streets have ample right-of-way for two lanes of travel plus parking, resulting in higher than desired speeds. 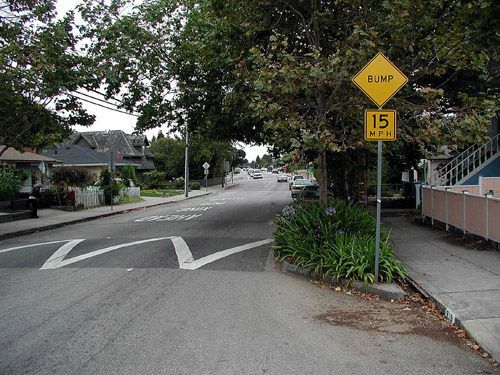 Speed humps shall not be placed in front of driveways or other significant access areas. 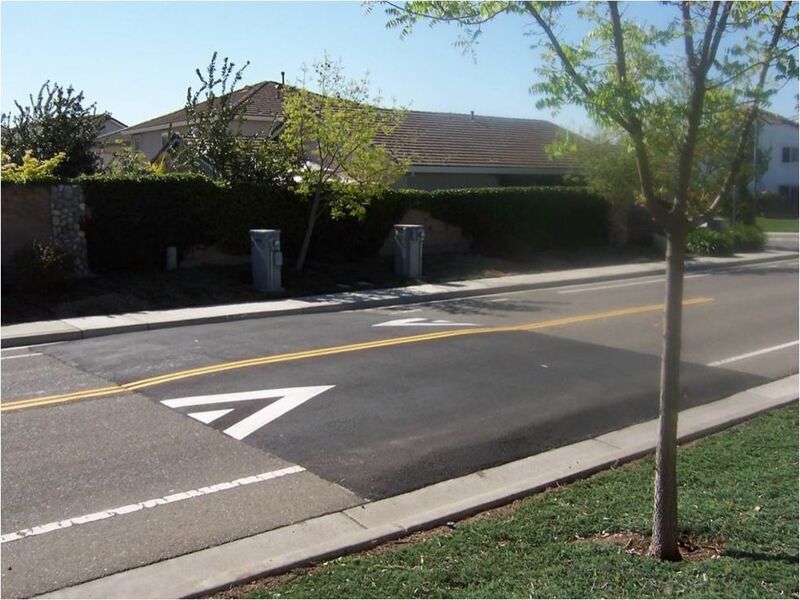 Where frequent driveways make the application of a speed hump difficult, reduce the overall size of the speed hump, or work with local residents to find a workable solution. Vertical speed control elements shall be accompanied by a sign warning drivers of the upcoming device. (MUTCD W17-1). Slopes should not exceed 1:10 or be less steep than 1:25. Side slopes on tapers should be no greater than 1:6. The vertical lip should be no more than a quarter-inch high. Locate vertical speed control elements where there is sufficient visibility and available lighting. 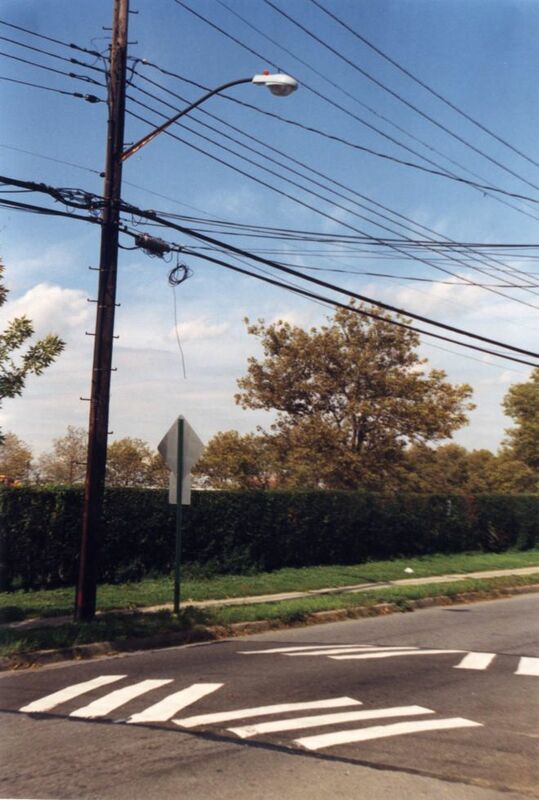 Spacing for vertical speed controls should be determined based on the target speed of the roadway. 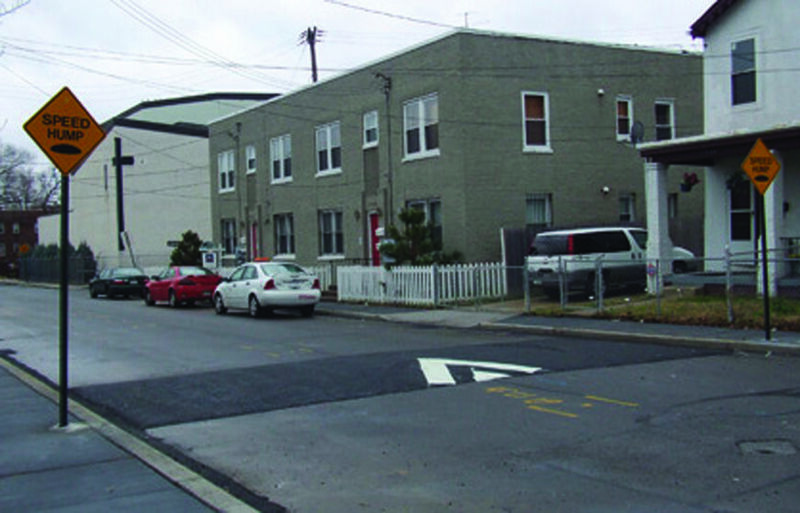 Speed humps should be spaced no more than a maximum of 500 feet apart to achieve an 85th percentile speed of 25–35 mph. To achieve greater speed reductions, space speed humps close together. Speed humps may be applied on 1-way or 2-way roads. City of Sacramento. Speed Hump Program Guidelines. Sacramento: 2004. Bunte, Leslie Jr. “Traffic Calming Programs and Emergency Response: A Competition of Two Public Goods.” Austin: Graduate School of the University of Austin, University of Texas at Austin, 2000. Ewing, Reid. "Impacts of Traffic Calming." Transportation Quarterly (2001): 55(1): 33-46. Gwinnett County Department of Transportation. Speed Hump Program Manual. Gwinnett County: 2009. Hallmark, Shauna, K. Knapp, G. Thomas, and D. Smith. “Temporary Speed Hump Impact Evaluation.” Ames, Iowa: Center for Transportation Research and Education, Iowa State University, 2002. Huang, Herman F., and Michael J. Cynecki. 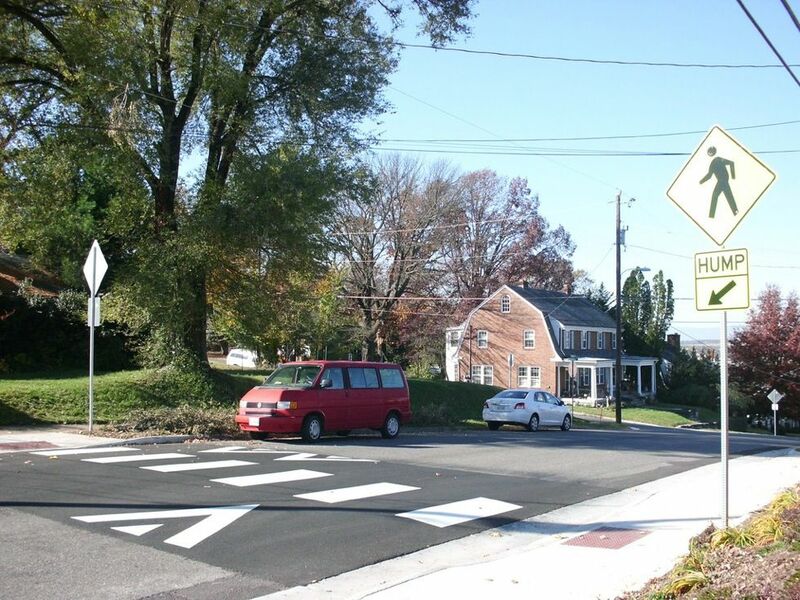 "Effects of Traffic Calming Measures on Pedestrian and Motorist Behavior." Transportation Research Record: Journal of the Transportation Research Board 1705 (2000): 26-31. Johnson, L., and A. J. Nedzesky. "A Comparative Study of Speed Humps, Speed Slots and Speed Cushions." Presented at the ITE 2004 Annual Meeting and Exhibit, Lake Buena Vista, Florida, August 1-4, 2004. Parkhill, Margaret, Rudolph Sooklall, and Geni Bahar. 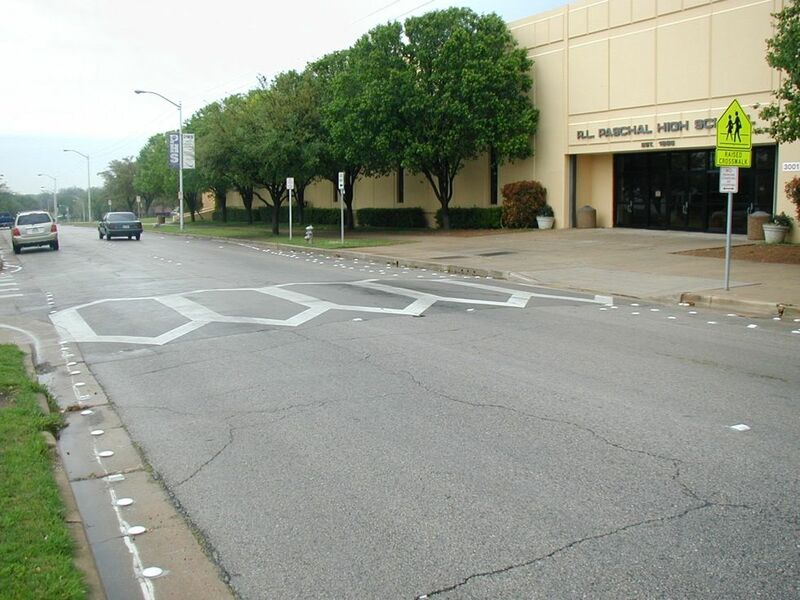 "Updated Guidelines for the Design and Application of Speed Humps." Presented at the ITE 2007 Annual Meeting and Exhibit, Pittsburgh, Pennsylvania, August 5-8, 2007. Weber, Philip A., and John P. Braaksma. 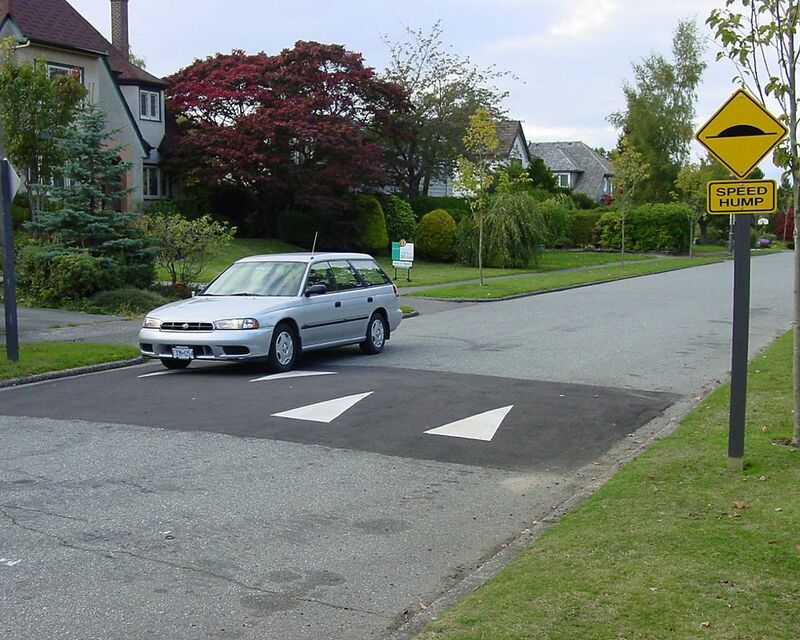 "Towards a North American Geometric Design Standard for Speed Humps." ITE JOURNAL (2000): 70(1), 30-39. 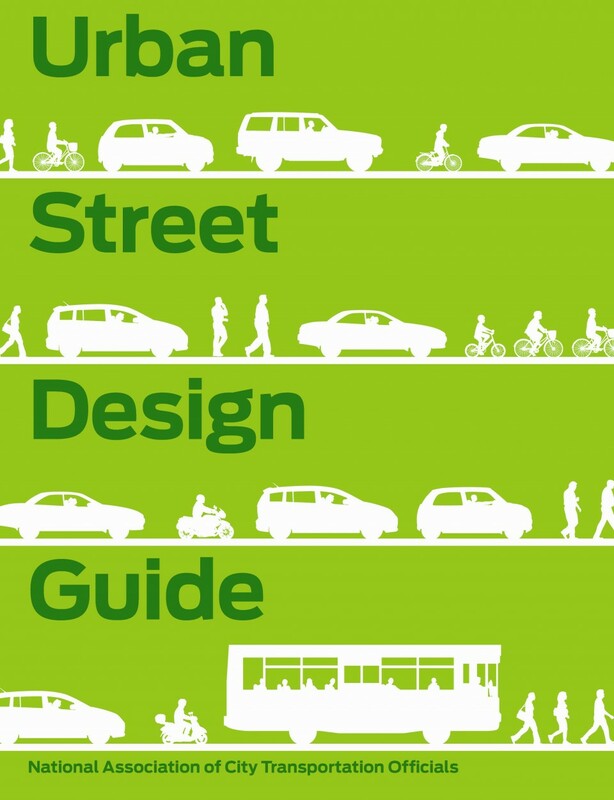 Adapted from the Urban Street Design Guide, published by Island Press. 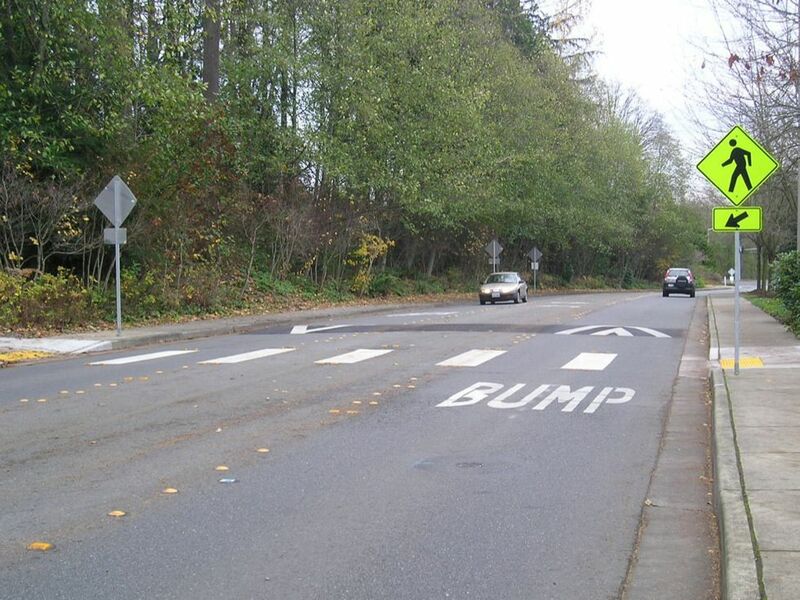 References for Speed Humps: 9 found. Johnson, L & Nedzesky, AJ. "A Comparative Study of Speed Humps, Speed Slots and Speed Cushions." Presented at the ITE 2004 Annual Meeting and Exhibit, Institute of Transportation Engineers, Lake Buena Vista, FL. City of Sacramento Transportation Division. 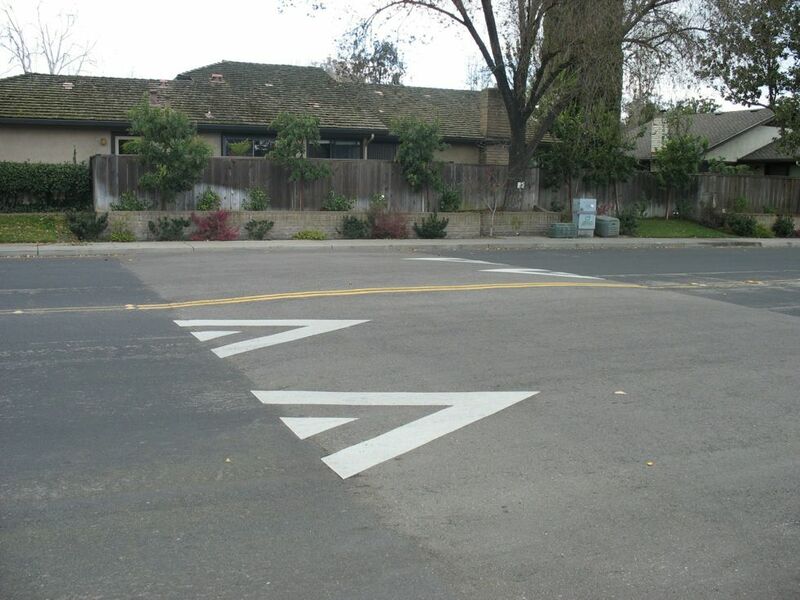 "City of Sacramento Speed Hump Program Guidelines." Transportation Division, City of Sacramento, Sacramento, CA. Huang, Herman F & Micahel J. Cynecki. 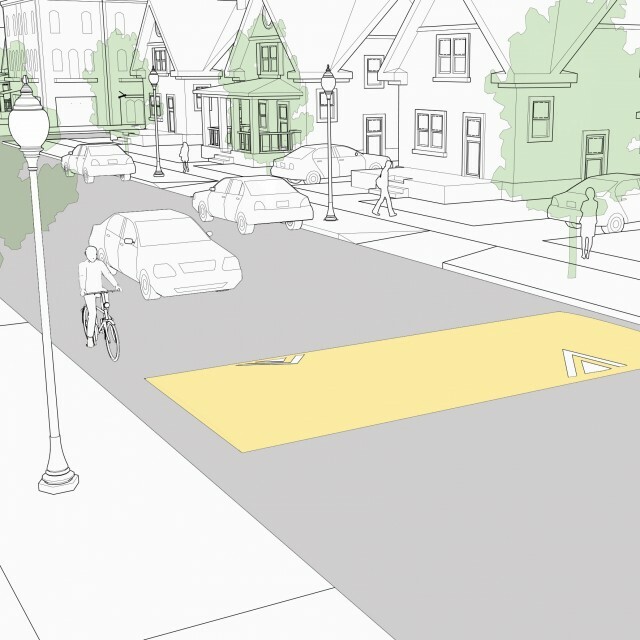 "Effects of Traffic Calming Measures on Pedestrian and Motorist Behavior." Transportation Research Record 1705 26–31, Transportation Research Board, Washington, DC. Ewing, Reid. "Impacts of Traffic Calming." Surface Transportation Policy Project, Transportation Quarterly 55(1), 33-46, Transportation Research Board, Washington, DC. Gwinnett County Department of Transportation. "Speed Hump Program Manual." Traffic Engineering and Planning Division, Gwinnett County Department of Transportation, Lawrenceville, GA.
Hallmark, Shauna, Keith Knapp, Gary Thomas, & Dan Smith. "Temporary Speed Hump Impact Evaluation." Center for Transportation Research and Education, Iowa State University, Ames, IA. Weber, Philip A & John P Braaksma. 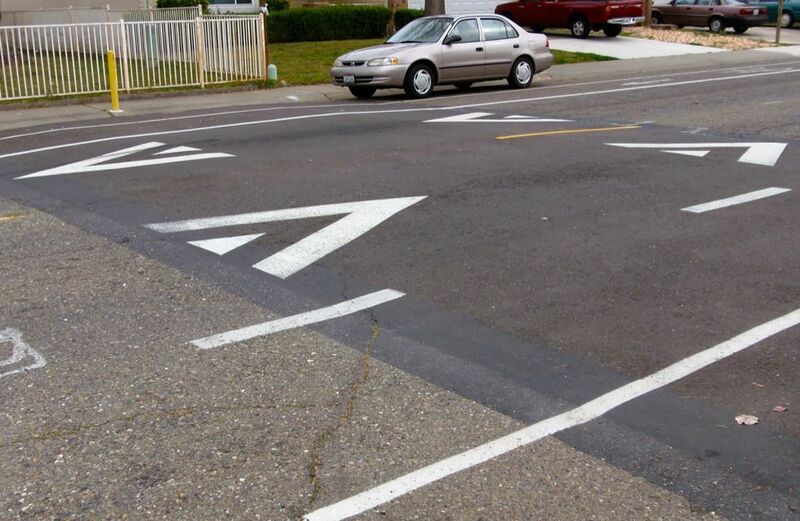 "Towards a North American Geometric Design Standard for Speed Humps." ITE Journal 70(1), 30-39, Institute of Transportation Engineers, Washington, DC. Bunte, Leslie, Jr.. "Traffic Calming Programs and Emergency Response: A Competition of Two Public Goods." Graduate School of the University of Texas, University of Texas-Austin, Austin, TX. Parkhill, Margaret, Rudolph Sooklall & Geni Bahar. 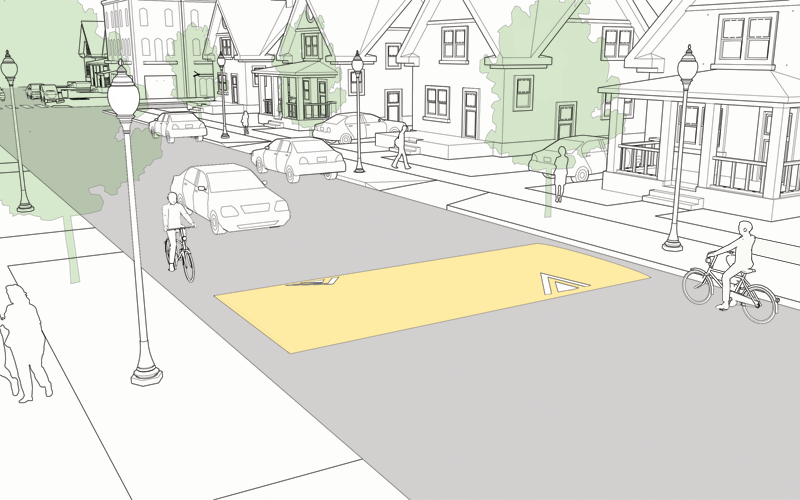 "Updated Guidelines for the Design and Application of Speed Humps." ITE Journal, Institute of Transportation Engineers, Washington, DC. No results - please refine your search and try again.